Some CereScape applications for iPhone and iPad. All are available via the Apple iTunes App Store. A distance to sound app to assist visually impaired persons get around indoors and outdoors. Please go to the DayRadar page via this link for more information. 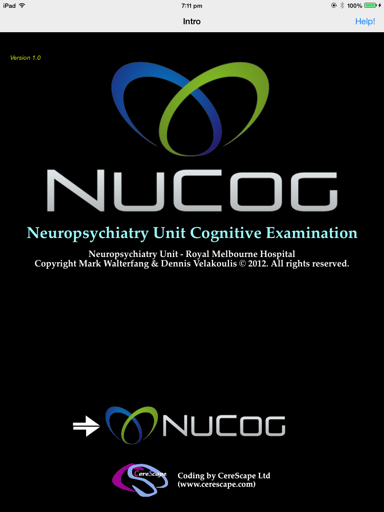 NuCog - Neuropsychiatry Unit Cognitive assessment for iPad. 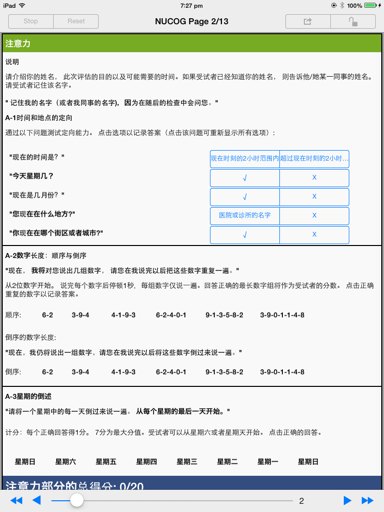 This application was released initially on 4 Apr 2014 (latest release Jun 2016). This app is now free. 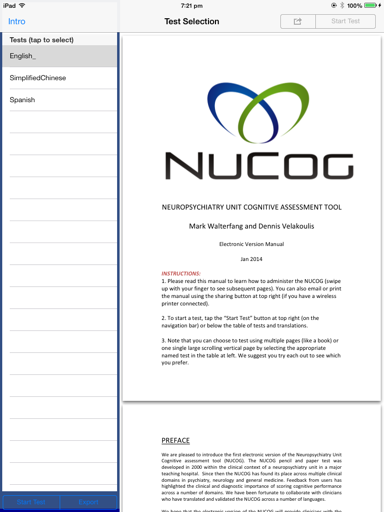 This is the first electronic version of the Neuropsychiatry Unit Cognitive assessment tool (NUCOG). The NUCOG pencil and paper test was developed in 2000 within the clinical context of a neuropsychiatry unit in a major teaching hospital. Since then the NUCOG has found its place across multiple clinical domains in psychiatry, neurology and general medicine. 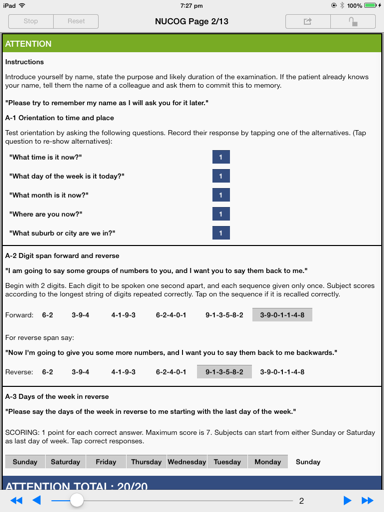 Feedback from users has highlighted the clinical and diagnostic importance of scoring cognitive performance across a number of domains. 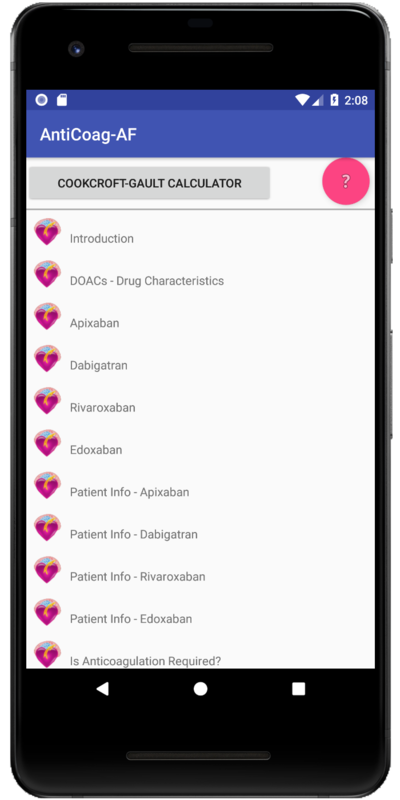 We have been fortunate to collaborate with clinicians who have translated and validated the NUCOG across a number of languages and offer it initially in Simplified Chinese, Spanish, Malay Portuguese, Uyghur as well as English. Please contact us if you would like to help translate it into other languages useful to you and your colleagues. 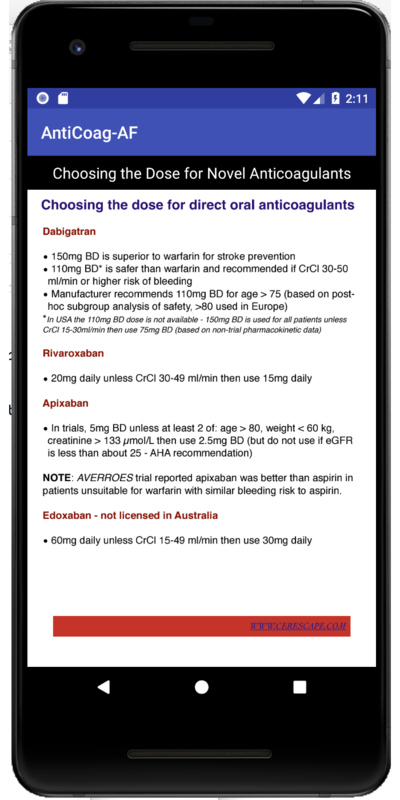 This electronic version of the NUCOG will provide clinicians with the same degree of clinical information within an electronic format. It replicates the format of the original NUCOG but allows automatic scoring, use of iPad camera to photograph patient copies, and electronic sharing using pdf format. 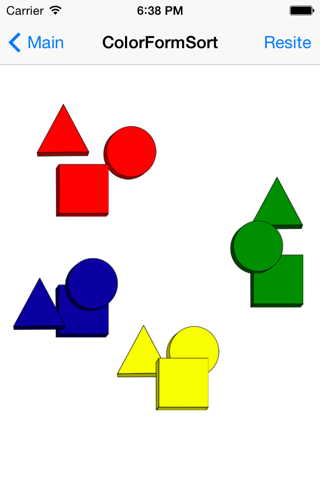 As with the original NUCOG, the NUCOG application provides the rater with scores across the five domains of attention, memory, executive function, language and a domain named ‘visuoconstruction’. As a result of the multidimensional scoring system, a pattern of cognitive change can be discerned and integrated within the clinical assessment. The NUCOG takes about 20 minutes to complete, though our initial beta testing of the e-version has suggested that this time is reduced by about 10%. It is aimed at any medical practitioner who sees patients with possible cognitive impairment and wants a more detailed neurobehavioural screening or cognitive ability monitoring test. 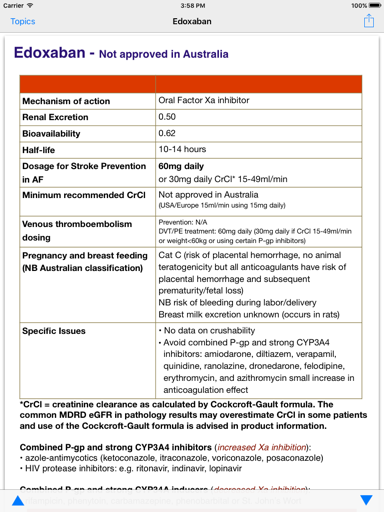 It was developed by Drs Mark Walterfang and Dennis Velakoulis of the Royal Melbourne Hospital. For more information, the NUCOG web site is at www.nucog.com.au. If you are interested in learning more or contacting us, please use the Contact Us page. 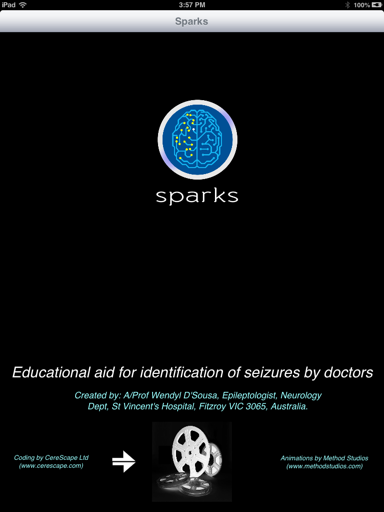 FirstSparks - Epilepsy seizure type identification application. This application was released in Oct 2013. 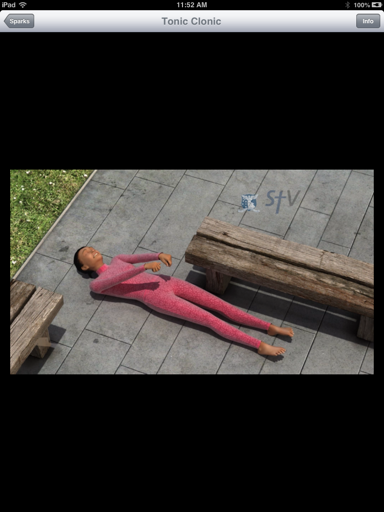 Identification of the type of seizure is often a problem in medical practice. This application provides very high quality animated videos of 8 common types of seizure including absence, atonic, tonic clonic and tonic seizures (and some rarer ones). Using videos overcomes the problems inherent in using videos of real people having these seizures, allowing facial features and composites of what might be seen. 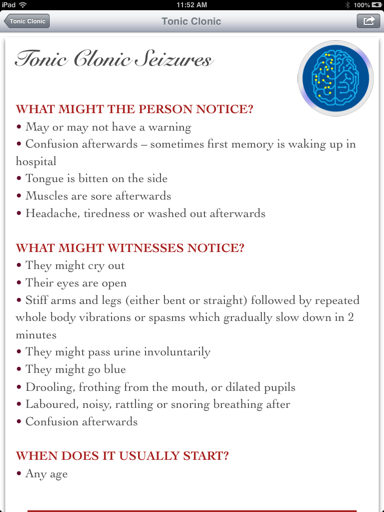 It is aimed at medical practitioners who see patients with possible seizures and witnesses who have seen these. They can give the application to the witness and let them look through the types of seizures to see which looks like the seizure they witnessed. This is often better than trying to describe what they saw (which is confounded by emotional reactions at the time, safety concerns and lack of medical terminology to describe events). Once the seizure type is identified, there are helpful medical notes including what questions might help confirm the seizure type and what to expect if they need more expert evaluation. 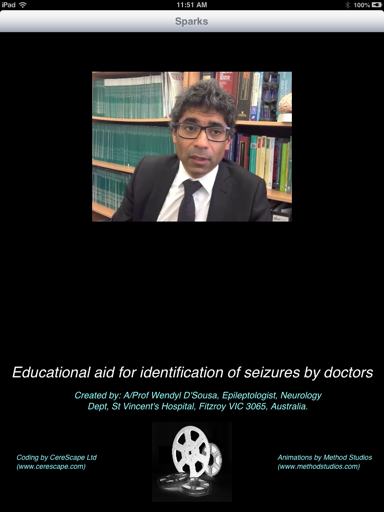 It was developed by A/Prof Wendyl D'Souza of the University of Melbourne using research funds (the videos were very expensive due to their very high quality). He has a research web site at www.sparks.org.au. 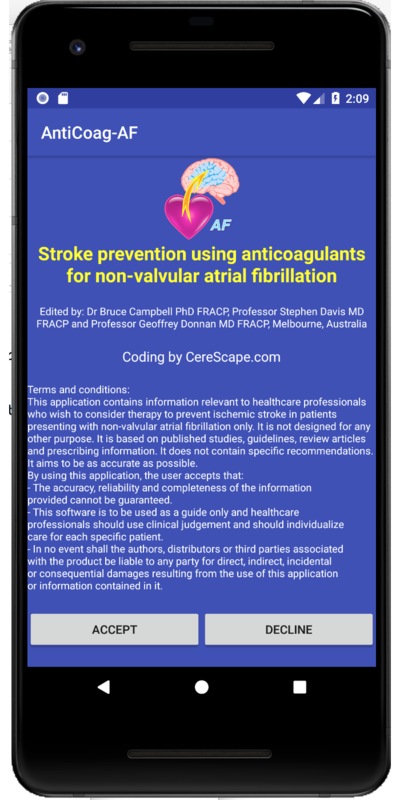 AntiCoagAF - Information on anticoagulation in non-valvular atrial fibrillation for stroke prevention. 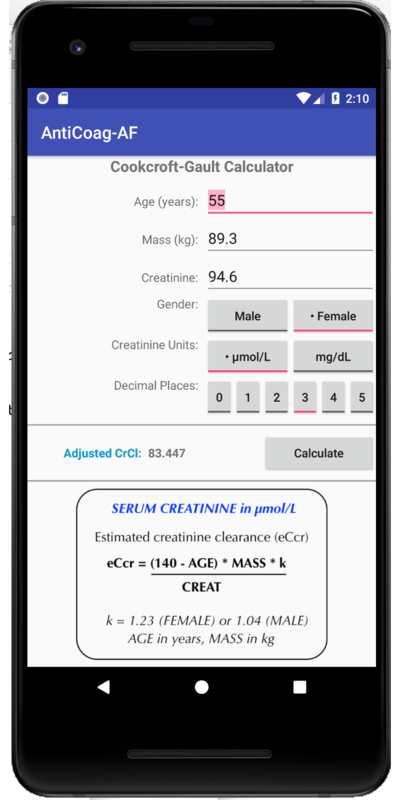 This application was released initially Nov 2013 (current version 1.0.3, released Jun 2016). 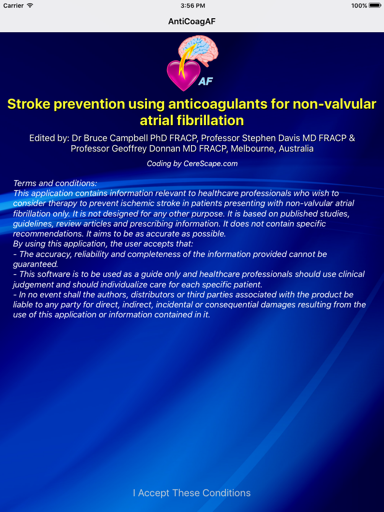 This is for medical practitioners who need to quickly review which anticoagulant (including the direct oral anticoagulants (DOACs)) to use to prevent stroke in patients with non-valvular atrial fibrillation (NVAF). 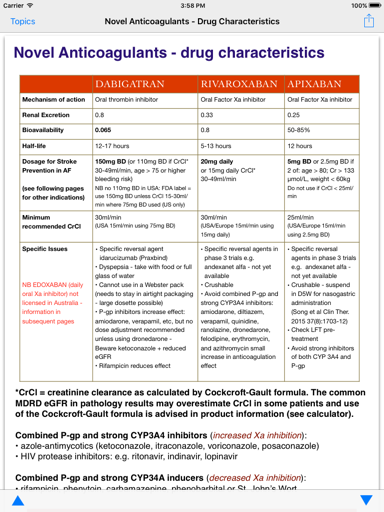 It contains relevant information about warfarin, apixaban, dabigatran, rivaroxaban and edoxaban. 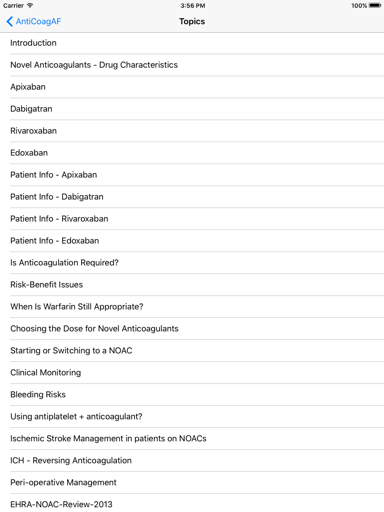 Topics covered include: comparison of anticoagulants, patient information, when anticoagulation is required, risk-benefit issues, when warfarin is appropriate, how to choose the dose of a NOAC, starting or switching between anticoagulants, clinical monitoring, bleeding risks, use of antiplatelet agents in addition to oral anticoagulants, managing ischemic strokes on NOACs, reversing anticoagulation in the event of intracerebral haemorrhage, and peri-operative management information. 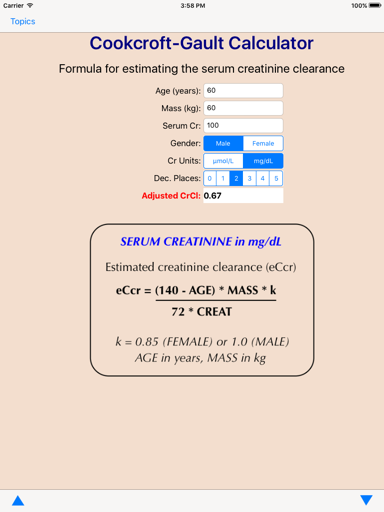 There is now a Cookcroft-Gault creatinine clearance calculator. Information contained within the application was edited by Dr Bruce Campbell. Coding was by CereScape (www.cerescape.com). It is our aim to keep this information current, and we welcome constructive comments and evidenced updated information. Any profit generated by this application will be used to fund stroke research. 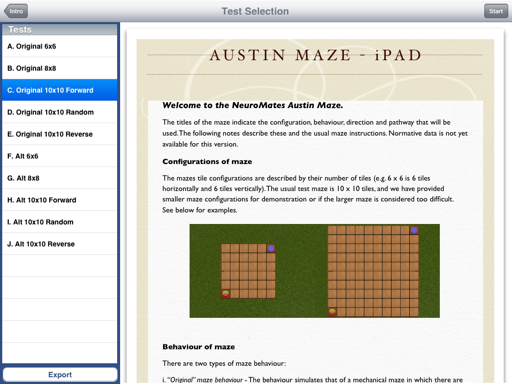 Austin Maze - Neuropsychological executive task application. 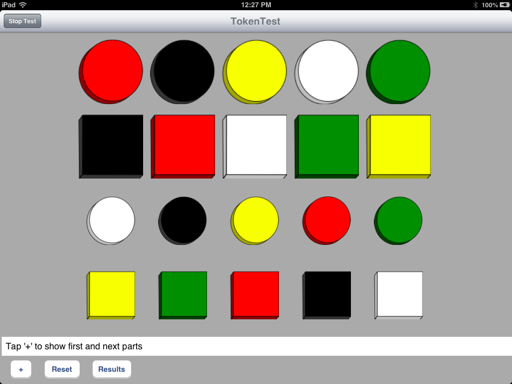 This is a specialized iPad application for neuropsychological evaluation. It presents the classic 10x10 hidden pathway stylus maze originally developed by Prof Brenda Milner (MNI) and revised by Dr Kevin Walsh (see Walsh's neuropsychology, 5th Edition). It includes both the original pathway and randomly chosen equivalent new pathways, as well as smaller practice mazes. Errors are accumulated and can be emailed as a report. 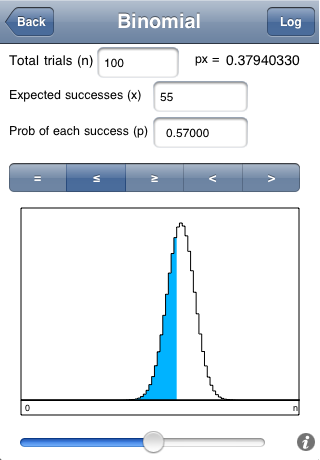 Total errors for each round appear over the maze for progressive feedback. 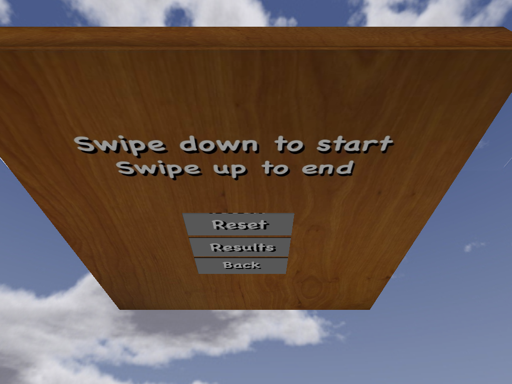 It is written using OpenGL with the maze in 3D and an appealing wood grain finish. 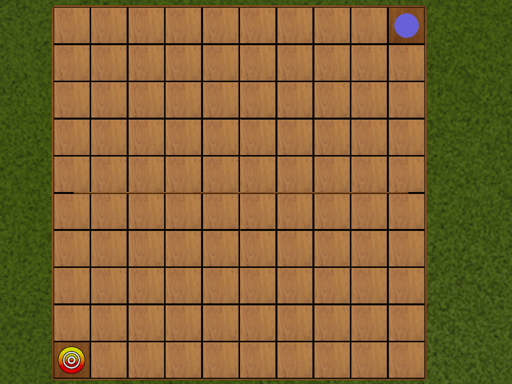 Green ticks indicate tile is on hidden path. 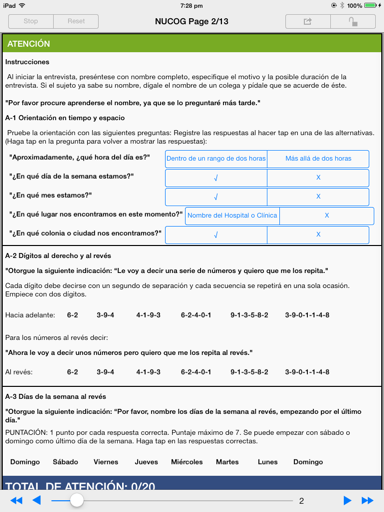 Token Test - Neuropsychological language comprehension task. This is a specialized iPad application for neuropsychological evaluation of the comprehension of language. 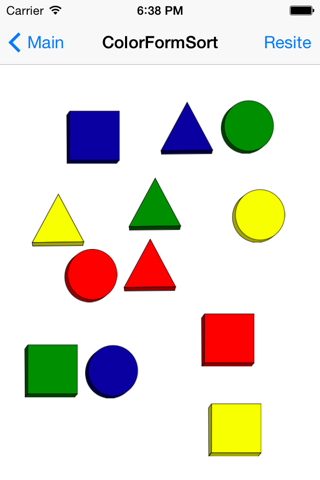 It presents the classic published versions of the Token Test which use colored and shaped tokens to test the ability of a patient to correctly understand increasingly difficult instructions (both in terms of number of items and syntactic complexity). 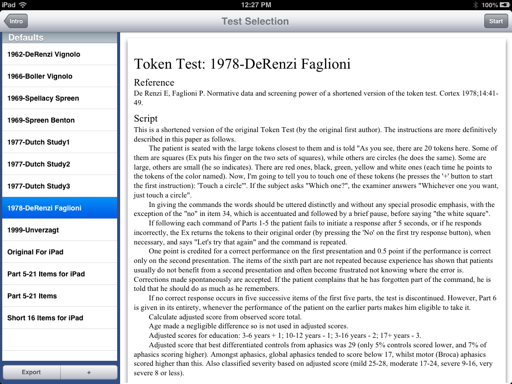 Forms optimized for the iPad are also included. It includes the ability to customize existing versions to make new versions or to use the existing versions to create different language versions. It is aimed at neuropsychologists, speech pathologists and neurologists with an interest in specialized language assessment. 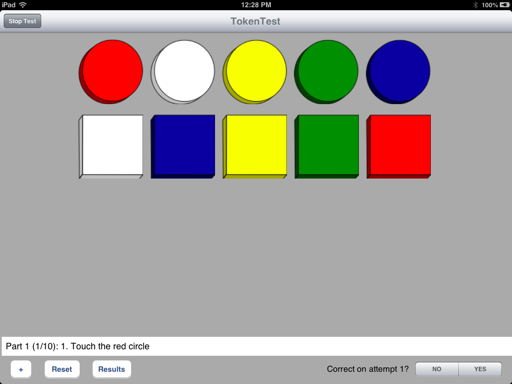 Token Test selection screen with manual. 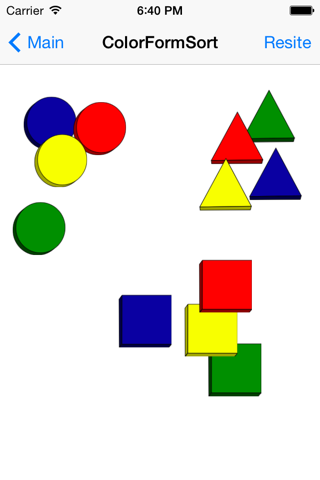 Sample layout of original Token Test. Sample question - examiner controls at bottom. Correct response to question shown. 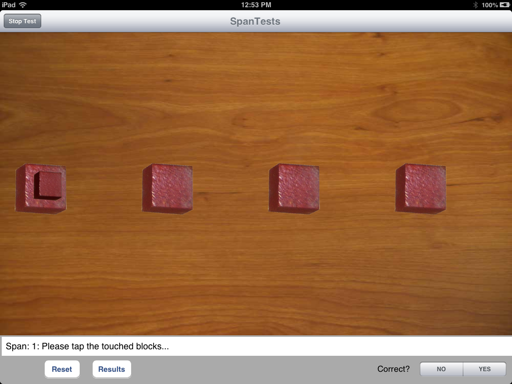 SpanTests - Neuropsychological digit and visual span tasks. 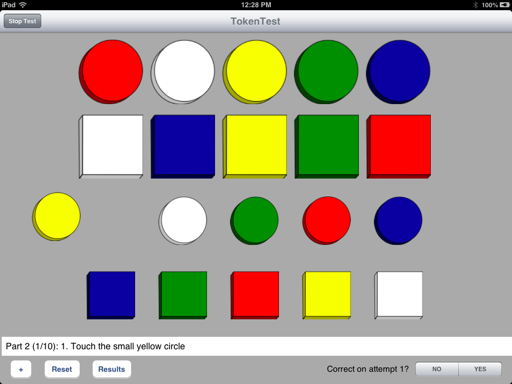 This is a specialized iPad application for neuropsychological evaluation of immediate and working memory. It presents various forms of randomly chosen digits in increasing number, and visual span tests (Corsi blocks, Knox cube test). The iPad provides a simple and intuitive interface with randomly chosen digit sequences for the examiner to read out tap if correct. 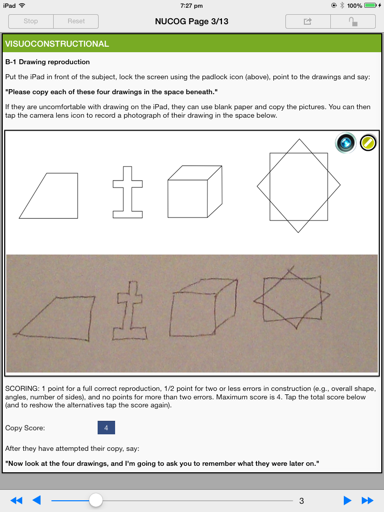 Visual span tests are done with 3D like interactive presentations for the examinee to tap. Correct order is presented using an automated hand and finger (freeing the examiner from having to remember the correct sequence or use paper aids). Results are tabulated automatically and can be emailed to the examiner. This test is aimed at neuropsychologists, speech pathologists, neurologists and psychiatrists with an interest in specialized language assessment. 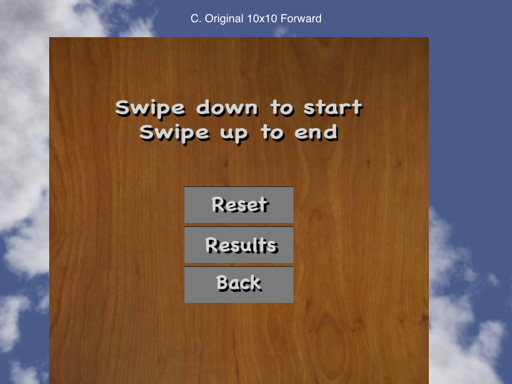 Test selection screen (with manual). Opening screen of digit span task. 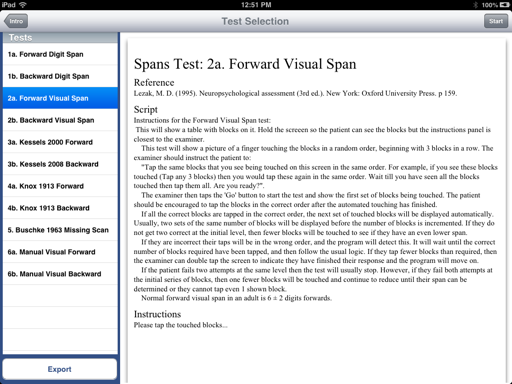 Visual span (Corsi blocks) automated demonstration. 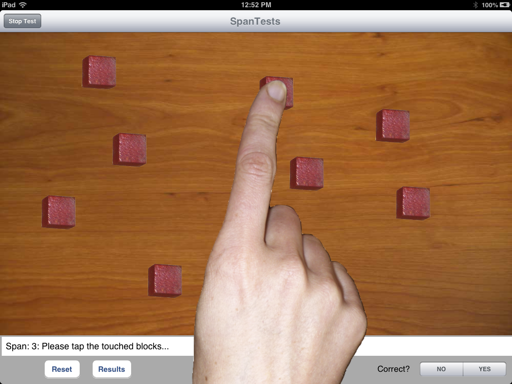 Hand indicating next block to touch. Knox cube test (smaller block indicating sequence). 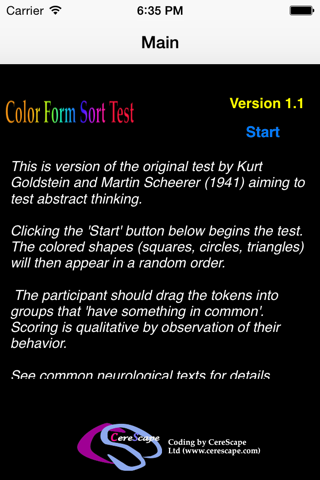 Color Form Sort test - Neurological shifting task. 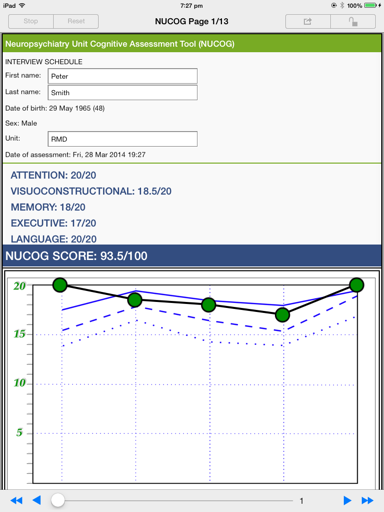 This is an iPhone or iPad application for neurological evaluation of cognitive flexibility. It was typically used in alcohol-related brain damage to detect difficulty in shifting mental set. 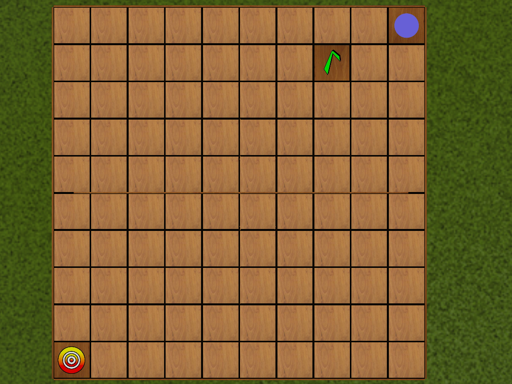 It presents colored tokens in several shapes and will randomly resite these for each trial. Scoring is qualitative. This test is aimed at neurologists, neuropsychologists and psychiatrists with an interest in specialized cognitive assessment. 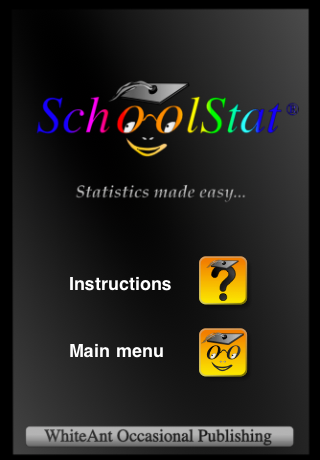 SchoolStat - Statistics & probability application. Originally written as a Pascal, then C application for Mac OS over 15 years ago, and now ported to iOS. This provides powerful statistical analyses using a spreadsheet for data entry. 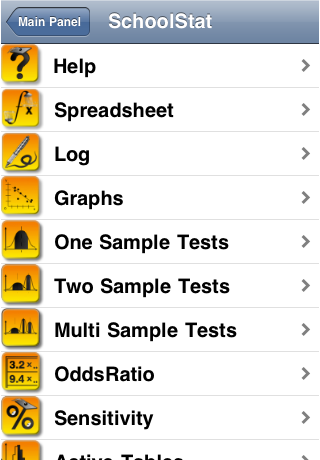 It includes single and multiple variable parametric and non-parametric statistics, simple graphing capabilities, and statistical tables. 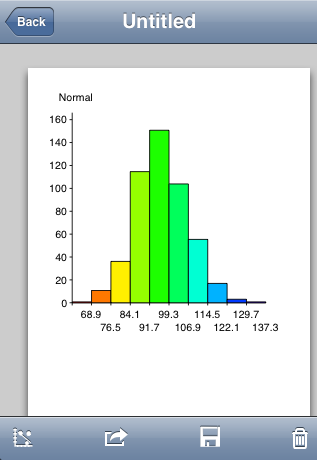 Graph of normal distribution (histogram). 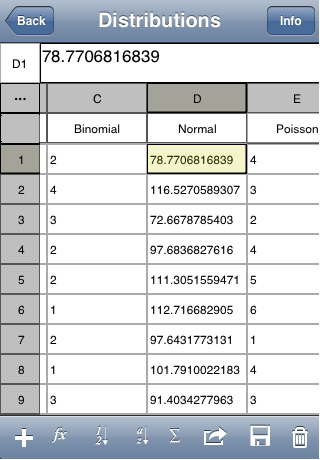 Discrete binomial probability active table.